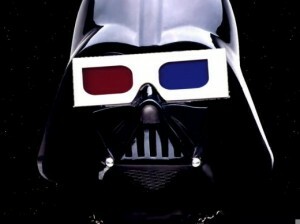 Star Wars 3-D Films Get Release Dates!!! a few weeks ago, George Lucas announced that he was wanting to jump in on the 3-D craze that has hit the entertainment industry and convert all the Star Wars films to 3-D.
Well, Lucas has a release date of February 10, 2012. It will start with Episode 1: The Phantom Menace. And if sales are great, then he will release the rest of the films for a theatrical 3-D release annually. That means Jedi will be released in 2017. Lucasfilm Ltd. and Twentieth Century Fox announced today that the 3D theatrical launch of Star Wars: Episode I The Phantom Menace now has an official release date — February 10, 2012! Set against the thrilling and exotic backdrop of a “galaxy far, far away,” Star Wars is perfectly suited to the immersive 3D theatrical experience, and Episode I delivers some of the Saga’s most stunning and spectacular sequences — from the Naboo invasion to the Tatooine Podraces to the climactic lightsaber battle between Darth Maul and the Jedi. Disney and Lucas Film Are Scrapping the Re-Releases of Original ‘Star Wars’ Films in 3D!!! More Details Emerge on The Star Wars Phantom Menace 3D Conversion!!! This entry was posted on Thursday, March 3rd, 2011 at 2:13 pm	and is filed under Film, News. You can follow any responses to this entry through the RSS 2.0 feed. You can skip to the end and leave a response. Pinging is currently not allowed. « See Red Skull from The Upcoming Captain America Film!! !